Gone are the days when the menu of a restaurant would remain the same for decades. The latest trend, which is an ingenious marketing idea, is to keep changing the menu on either a seasonal basis or at least every year or two. What this does is it allows the chefs, who’ve started coming out of the kitchens to bask in the rays of fame, to showcase their talent and in the process get the customers excited about something innovative, which should technically lead to repeat business. Another example of this is the “tasting menu” which serves exactly the same purpose but focuses more on the ability of the chef to experiment frequently. The “launch” of a new menu is a time for celebration. It’s all about new additions, new beginnings, and while there’s some nervousness, especially with a restaurant like Farzi which is already doing well, this shows a certain confidence that hopefully not only reflects in the business model of the restaurant but also in the new dishes which should come with equally bold flavours and tastes. A guest of Eazy Diner for the new menu tasting, Farzi was abuzz with industry bigwigs, media, and the homegrown blogger community. Low lighting and loud music – but astonishingly good music – seems to be something that Farzi is proud of, a concern of mine that I reflected upon in my review a few months back, but for now it suited the occasion even though it meant I had to text the people on my table in order to hold a conversation with them (who says mobile phones have no purpose on dinner tables). Listening to Zorawar Kalra, the brains behind the entire setup, the conceptual thought behind Farzi is to make “Indian food cool… and use molecular gastronomy at a subliminal level to enhance flavours”. 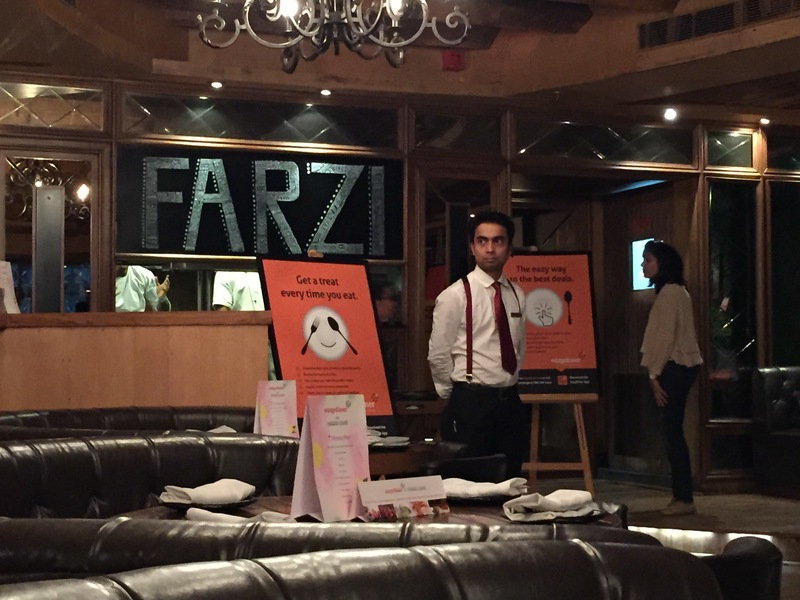 There’s also a lot of drama thanks to “tableside theatrics” and detail to presentation that makes Farzi stand out and above its competition. Farzi Cafe has established its name in the industry based on wacky presentations, a hint of molecular gastronomy, but most importantly it has stayed true to the food. 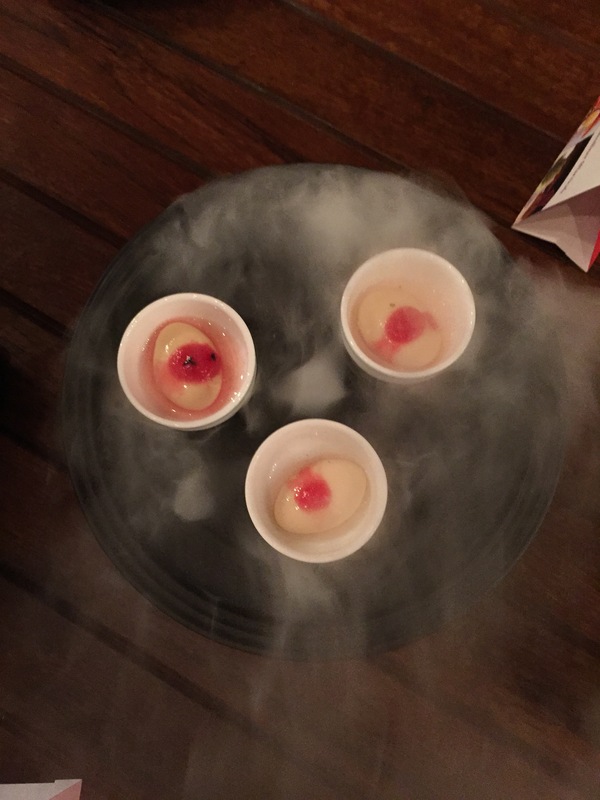 There’s the palate cleansing Mishti Dohi shots (on the house) that come on a bed of smoke, or the Flaming Goose, a little something that’s not on the menu, so you’d have to really know the management to get them to do this for you, but it’s worth the money as no doubt this will lead to some serious neighbor’s envy. Chilly Duck Samosa with Plum Chutney – be it the stringiness of the meat or the slightly chewy nature, duck has always been a favourite. 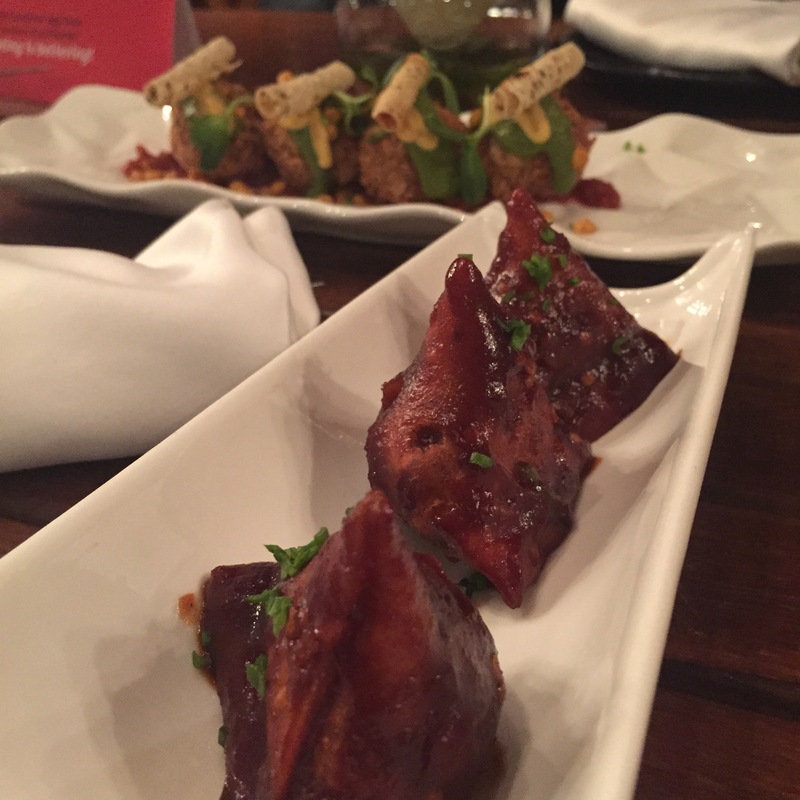 Even though I failed to recognize the meat at first bite, shameful I know, these Duck Samosas were such a wonderful change from the vegetarian options that I have on a regular basis. A good amount of filling in a crispy samosa and sticky plum chutney dripping over it makes this dish a fiery option and would satisfy those that like their food to give them a nice big kick in the depth of their mouths. For me, even though the chilly aspect was tear inducing, I couldn’t help myself from taking just one more bite after another. 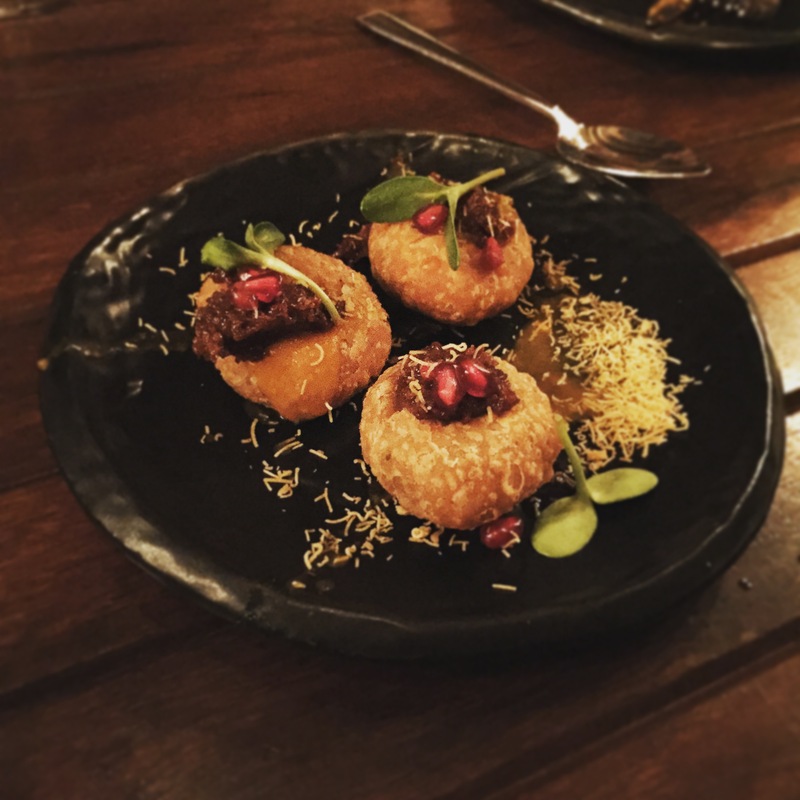 Smoked Bacon and Pyaaz ki Kachori with Aaloo Rassa Reduction– the only thing that can trump duck for me is bacon. Definitely the hit of the evening, and rightly so, because I believe Bacon can make anything and everyone perfect. So, whether it’s the genius of the chef to take something so desi as the Kachori and fill it up with something so Western but universally admired as bacon, or maybe it was just the warmth of the filling inside the crunchiness of the outer shell, this thing worked and not only that, it worked wonders. The best part though was picking out small bits of crunchy bacon from my teeth for the rest of the evening. C.M.T Chicken Tikka with Cornish Cruncher Naan – some things don’t need to be re-invented, they just need to be done right. The Chicken Tikka is now an international favourite, and the one served at Farzi is all about soft, moist, and juicy pieces of boneless chicken bathing in a delicious, slightly spicy, gravy that oozes richness and flavours to satisfy one and all (non-vegetarians of course). 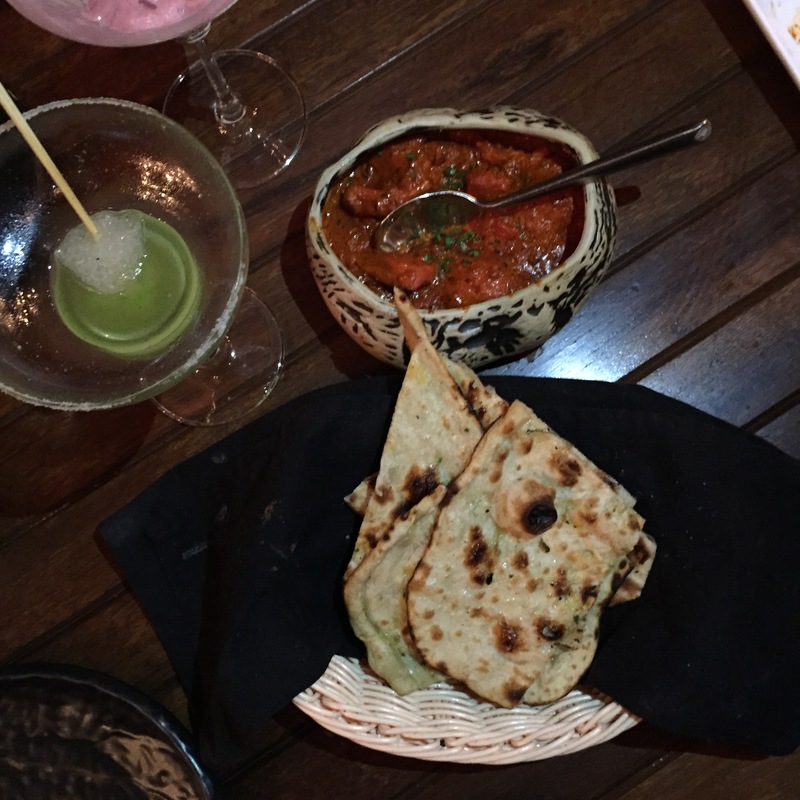 The Naan seemed regular, which was perfect for me as it helped keep the focus on the succulence of the tikka. 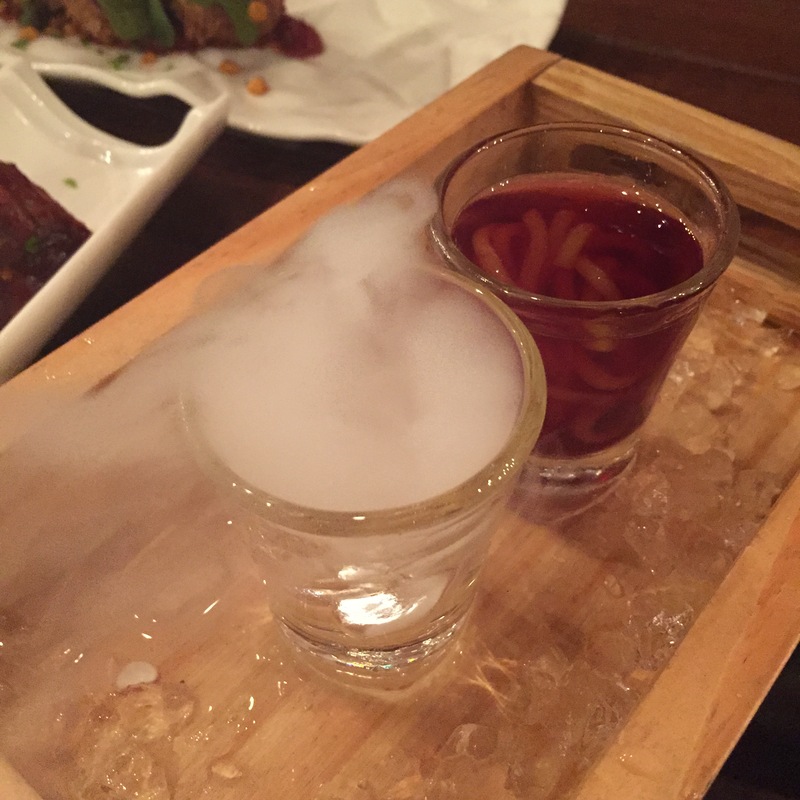 Spaghetti Shot – Even though this cocktail breaks one of the cardinal rules of the restaurant business – never serve anything that is not meant to be eaten (or in this case drunk) – in favour of some cloudy drama, the spaghetti shot is a homage to Jell-O shots that most have had during college. Strings of soft gulp-able spaghetti soaking in a healthy dose of alcohol (and just as it didn’t matter in college, it doesn’t matter now what type of alcohol it is). It’s important you don’t have too many of these lest you might blackout and mistake the spaghetti for worms the next morning during you bathroom call. 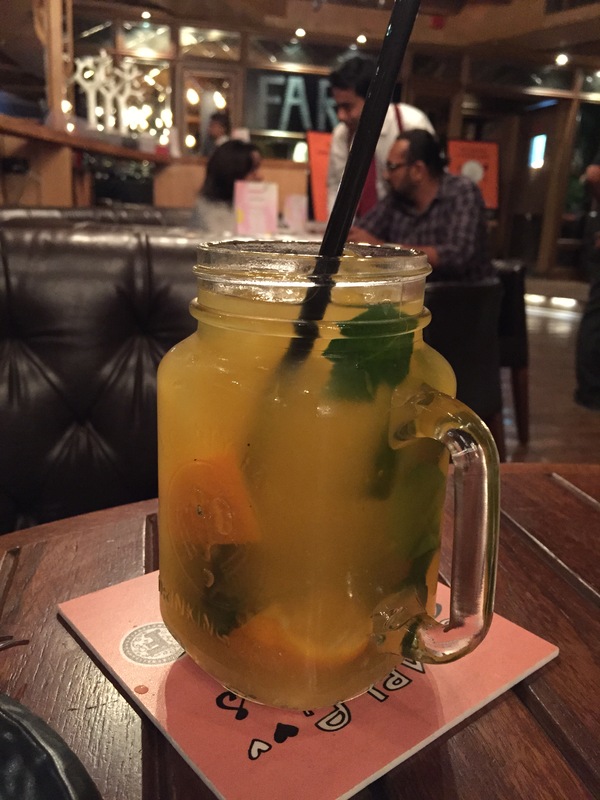 Farzi Tina – while I enjoyed the mocktail version, Farzi obviously has an alcoholic alternative available. A refreshing drink that comes in a mason jar (this trend seems to be sticking around for much longer than I thought) and is filled with copious amounts of goodies such as lime, orange slices, and basil leaves which make it hard to drink at times, but then the coolness and freshness hits you enough to bring any hot summer day, or the slight high-headedness from all the shots, down to their knees. These are my Top 5 picks from what I tasted over at Farzi. There are many more from their regular menu that I wholeheartedly recommend, The Galouti Burger and it’s vegetarian counterpart The Gupta Burger are on top of that list. Farzi is as much about showmanship as it is about the food and I enjoy the ambiance that in the evenings is very European in nature, but sometimes I do feel that it gets carried away a little in trying to be too hip and happening. But then, their afternoon service is more subtle and family oriented (kids are not allowed in the evenings) and I guess that strikes the right balance between culture, tradition, and modernism. All said and done, Farzi Café is the place to experiment with simply because they don’t hold back from experimenting with what they serve you, and that is always welcomed from an industry that was, in India, stuck in a time warp for quite a few decades. A special thanks to the folks over at Eazy Diner for the invite and of course the people at Farzi. The above has been written on my own accord and was not required as part of the invite.